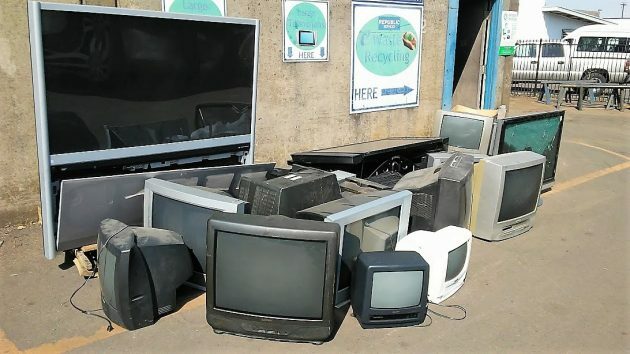 Old TVs pile up at Republic Services’ e-waste recycling center on Aug. 28. Technology marches on, and in case you had forgotten, you are reminded when you take a TV in for recycling because it was replaced by a new set long ago. A few days ago I dropped off a couple of old TVs at the Republic Services depot, 1214 Montgomery St. S.E. You can do that there, and at other places in Albany, because of a law passed by the legislature in 2007. The DEQ says we can take up to seven of those items at a time to a free recycling center. The state agency lists four such places in Albany. Besides Republic Services, they are Goodwill and St. Vincent de Paul on Pacific Boulevard, and Teen Challenge on Second Avenue. Thanks for the reminder! I have a few of those sitting around. Seems particularly apropos in this instance.